Before I get onto the first topic for Knitting & Crochet Blog Week, I'd like to extend a huge welcome to anyone visiting for the first time. 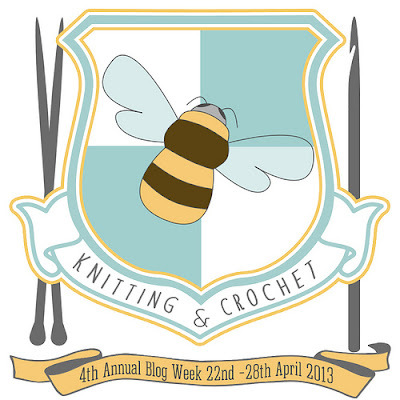 It's great to have you here, and of course to have the opportunity to hook up with so many other crafty bloggers over the next seven days. I hope that you like what you find here, and that you'll have time to leave a quick message in the comments so I can pop over and see you too - I'm really looking forward to it. When I started knitting, I had really good intentions. My aim was to finish each project before starting the next (and not to buy more yarn than I needed for the current project, but that's another story). Over the last couple of years, I realised this is not only impossible (for me), but highly impractical. Different projects most definitely fit different moods and crafting opportunities. Let me show you my current projects by way of explanation. Yes, I have five active WIPs, plus a long-term project I'll be telling you about tomorrow. Whippoorwill is "TV knitting" - simple enough to not need too much attention, and nice long rows. Sounds good, huh? Yes, until a couple of weeks ago I was watching a TV programme (that my husband worked on and so he was chatting about it at the same time) while knitting happily along until I realised I had veered off the pattern. The second time this has happened with this 'simple' knit - so simple, I get complacent. It'll get finished, but not this week. Saturday is someone's fourth birthday and two of my projects need to be ready before her party. With the deadline looming these are my focus for the week - the rest will have to wait. The Deja Vu socks (which I really didn't want to photograph again until finished, but we already established what happens to my best-laid plans) are "waiting outside ballet/karate/swimming knitting". Easily transported and with just the ribbing to finish, these are very easy to pick up and put down. This project lives in my handbag and will be replaced by another pair of socks once finished. Which brings me onto the final WIP - the crochet bag I started making and writing up during the school holidays. For those with children I probably need say no more. If you don't have children, let me just say that it's almost impossible to concentrate enough to write a pattern/recipe when they are both here, and I somehow managed to delete everything I'd written so far! Luckily I have notes in my Traveler's Notebook, but there hasn't been time to go back to it yet. So you see, if I only had one project I'd be scuppered. And as much as I'd like to think myself a 'monkey' who can tackle ambitious patterns to develop my skills with each new thing, it would be totally impractical. Being a busy buzzy bee suits me perfectly... for now. You can find more information about KCBW here and today's other posts by clicking this link. Have a great day - hope to see you tomorrow! I know too well both the chat chat chat ... whoops feeling and also the "I think I'll try this really ambitious project during the holidays" feeling ... hopeless! Oh, and the WIPs...I have a small car-WIP and a big project car-WIP, then 3 or 4 in the work room, and none by the TV, as I never sit in front of a tv! That would actually help, and give me time to work for longer stretches at a time. 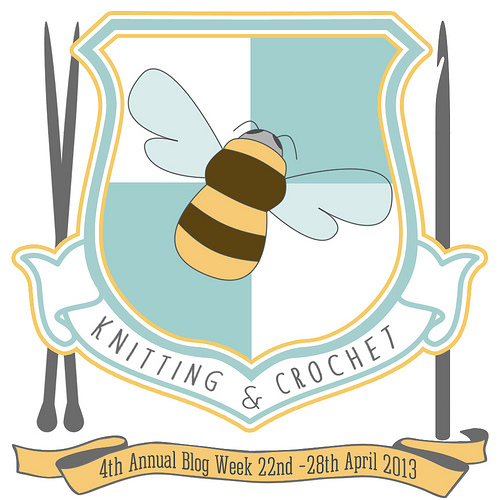 I've been reading your blog for the last few weeks (found you via WIP Wednesday, I think) - hello from another bee! 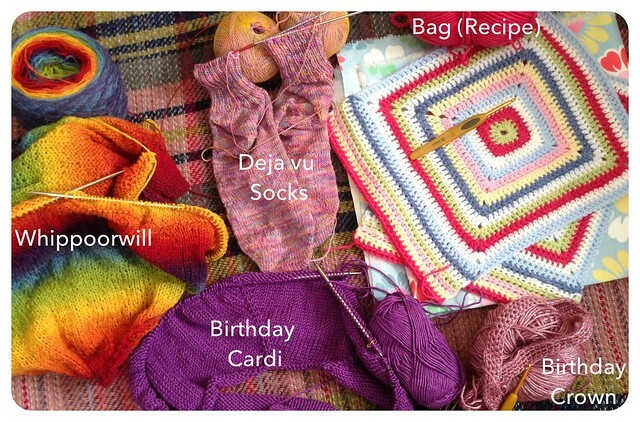 I totally agree on on the TV-knitting project & WIPs :) What a cheery collection of projects! I know that you are not alone in having different projects for different aspects of your life - I have read this a couple of times today and realise that I do something quite similar. We crafters never like to have idle hands! I suffered the same delusions as you did when I first started knitting. It took me a long time to admidt I had a problem. And now that I've come to grips with it...well, I still have a problem LOL. I love reading your blog. Shame I never get around to updating my own. I think I would probably be the walrus. I do have more than one project on the go and can get distracted from one, with another pretty...I don't pick my knitting up nearly as much as a dedicated knitter would. I just do it, as and when I feel like it. Oh I love the bright colours of your wip collection. Makes me want to add to mine. Oh us naughty Bees do just enable ourselves, don't we? I'm starting to wonder if Buzzy Bees are attracted to each other. Yours is the fourth blog on this subject and all the others were Bees also. It's definitely the house that I would fit into. Oooh all those WIPs make me excited. I figured out long ago that I'm not happy unless I have choice of what I want to work on. Gorgeous knits :) I love the colors of the bag. I am a Bee too, but like you I choose to regard it as being as time efficient as possible. To ensure that I always have a suitable project ready when a knitting opportunity presents itself. I'm a bee too. And oh my, I do know about those "best-laid plans!" I always underestimate the time it will take me to finish a project.